Here is my design for a tail light kit that I use for transporting my 2018 Hobie Pro Angler 14. The LED lights work GREAT! and it is easy to install and remove for transport. I designed and CNC machined the brackets that attach the Rigid Rail Bracket to the Hobie H Rail. 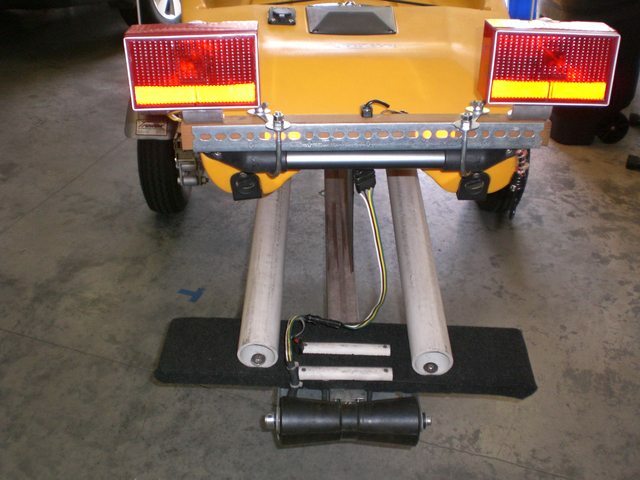 The RIGID RAIL Accessory Mounting System is coming to a Hobie near you soon. Last edited by hobie cnc solutions on Sat Feb 24, 2018 6:35 pm, edited 1 time in total. Sounds interesting, but your photo links appear to be broken. Cannot view. Sorry you are not able to view the attached images. I am new to the forum and copied the links from my gallery in Google Photos. I am able to view them. I wonder if anyone else is having issues viewing the 2 included photos. Photos are showing up fine now. Nice job on the fabrication! I assume that you wire this into a trailer harness to control turn signals and brake lighting? Thanks for the favorable comment and glad the pictures are now viewable. Yes, that is the way it will work. I still have a little work to do on the final design. I will share some additional pictures or video of the lights actually working. I load my 2018 Hobie Pro Angler 14 in my 2001 Honda Odyssey and several feet of the Hobie extend past that hatch when it is tied down for transport. I tend to leave early in the morning when it is still dark on fishing trips and want to make sure that the very back end of the Hobie is easily viewable by other drivers following me so I don't get rear ended. The key to this design will be to easily install and remove the LED tail light assembly during transport. Here is the completed installation of the Hobie Pro Angler 14 LED Tail Light Bracket Kit I made. The shows my design of Custom CNC Machined Dodecahedron (i.e. 12 sided internal shape) mounts that attach to the Hobie H Rail. Note: These mounts remain on the Hobie during kayaking operations and can easily be utilized to attach other accessories if desired. They are made from Delrin with all Stainless Steel hardware for Saltwater use. Also they don't interfere when using the Rear Hobie H Rail handle for lifting the kayak. I transport my Hobie Pro Angler 14 Kayak in the back of my 2001 Honda Odyssey. It overhangs the rear bumper by a few feet and I felt I needed some added safety protection from other vehicles. This item will give some added visibility (especially with the LED Lights) when transporting my kayak during the night and early morning hours. Last edited by hobie cnc solutions on Tue Mar 06, 2018 9:31 am, edited 1 time in total. Perhaps the problem is at my end, but the photos don’t open. same here. allni see is the word image. Sorry for the link issue. I think I have it now. Very nice solution elevating the lights. I too agree this greatly improves the trailer visibility by vehicles following you. 5 years ago I reused the incandescent trailer lights, that came with my Hobie Trailex trailer and mounted them on a scrap piece of 2 x 2 wood, steel "L" bracket and U-bolts with wing nuts as shown below. It's not as elegant as John's solution, but functional. Originally, a friend of mine gave me some of those magnetic towing lights from Harbor Freight that had incandescent light bulbs. They were not very bright so I found some LED lights on sale at Bass Pro Shops and that is what is on my current setup. The LED's are much brighter. I haven't actually used these yet, but will take a few pictures on my next outing so you guys can see how they work. I like you nice BIG lights and associated bracket. Thanks for sharing your ideas. The BIG deal here is trying to make the rear end of the kayak visible for drivers that are following you down the road. Any system or method will work and I think the effort is well worth the time spent making the necessary tail light mounting bracket. Wow, this production is great, I also recommend not to use incandescent light bulbs, because that can not reach the brightness we want, use the LED is a better choice, but my own current settings, I just use this, I want to send On my picture, but I can't send it out. I don't know why. I want to show you the effect I installed. I think I would prefer to mount the lights on the trailer on top of extensions that raise the lights up to where they would normally be on your truck.